So far, I’ve discussed long hand saws, and joinery saws. However, all of the saws I’ve discussed thus far have been for cutting straight lines. But not everything we do in traditional woodworking involves straight lines. The graceful cabriole legs of an 18th century high chest, the round top of a Shaker tripod table, and the pierced back splat of a chair all involve lines that aren’t straight. So sometimes we need to saw out a curve. Luckily for us, our ancestors thought of that too. Several saws designed for cutting curves, from Smith’s Key. The saw that most often comes to mind today when the discussion turns to cutting curves by hand is the metal framed coping saw. Unfortunately, the common contemporary coping saw has given what we refer to as turning saws somewhat of a bad name. That’s because the inexpensive versions of the modern coping saw are pretty worthless for just about anything. However, the traditional wooden framed turning saw, pictured above, is a thing of beauty. With a blade that is typically from about 1/8″ to about 5/16″ wide, this saw is capable of sawing out some very tight radius curves. The wooden frame is rigid enough to hold the blade with sufficient tension, applied by the string and toggle at the top, but light weight enough to saw comfortably all day. Turning saws like these used to be available in a number of lengths from about 12″ up to about 30″. Today, the 12″ length is the only size I’m aware of that is still being commercially made. In addition, it has become very challenging to find replacement blades, called webs, for these saws, in just about any length. This is unfortunate, because these saws are wonderful to use when they are sharp and well made. Peter Nicholson describes two additional saws for cutting curves. The first is the compass saw. § 53. The Compass Saw, Pl. 13. Fig. 9. Is for cutting the surfaces of wood into curved surfaces: for this purpose it is narrow, without a back, thicker on the cutting edge, as the teeth have no set. The plate is about an inch broad, next to the handle, and diminishes to about one quarter of an inch at the other extremity; here are about five teeth in the inch. The handle is single. The picture from Smith’s Key, above, shows a compass saw on the bottom right. Today, it is rather rare to find a decent example of a compass saw. Good ones are still available on the old tools market, but, while new ones are still being manufactured, there are not any decent modern makes of the compass saw that I’ve found. However, this style of saw excels at cutting broad curves with a large radius. Cuts like round or oval table tops and chair rockers are where this saw shines. A version of the pad saw, also called a keyhole saw because it was frequently used to saw out the keyhole opening in doors and furniture, is still being manufactured today. The last saw that Nicholson describes is what he refers to as a Key-hole or Turning Saw. Is similar to the compass saw in the plate, but the handle is long, and perforated from end to end, so that the plate may be inserted any distance within the handle. 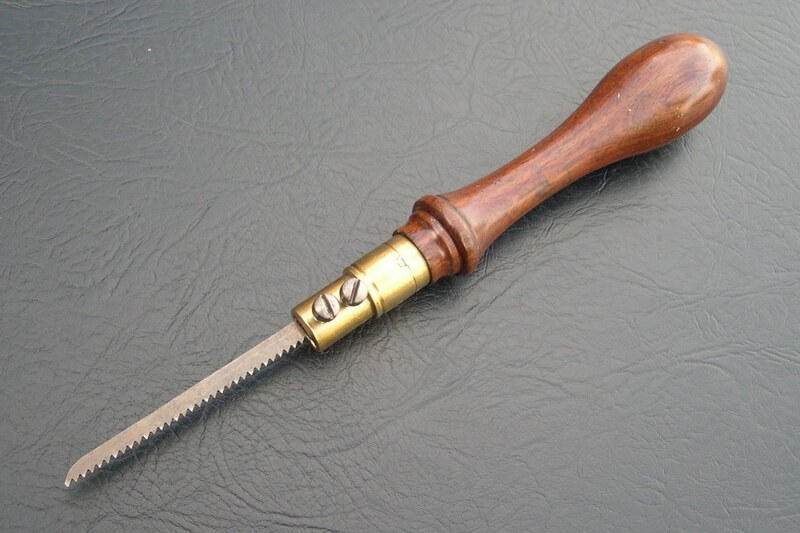 The lower part of the handle is provided with a pad, through which is inserted a screw, for the purpose of fastening the plate in the handle: the saw is used for turning out quick curves, as key-holes, and is therefore frequently called a key-hole saw. These saws are typically referred to as pad saws today. They are still being manufactured and the current versions are not terrible once the blade is sharp. Most people today will use a framed turning saw to do the type of work that the pad saw was designed to do. However, the benefit of the pad saw over the framed turning saw is that the blade in the pad saw does not have to be removed for the saw to be used within an enclosed hole, like a key-hole. To use a framed saw for this type of work, the blade has to be removed from one of the pins, inserted through the hole, reconnected to the saw frame, and then retensioned. The benefit that the framed turning saw has over the pad saw, however, is that the blade in the framed turning saw can be thinner and finer because of the tension applied by the frame. 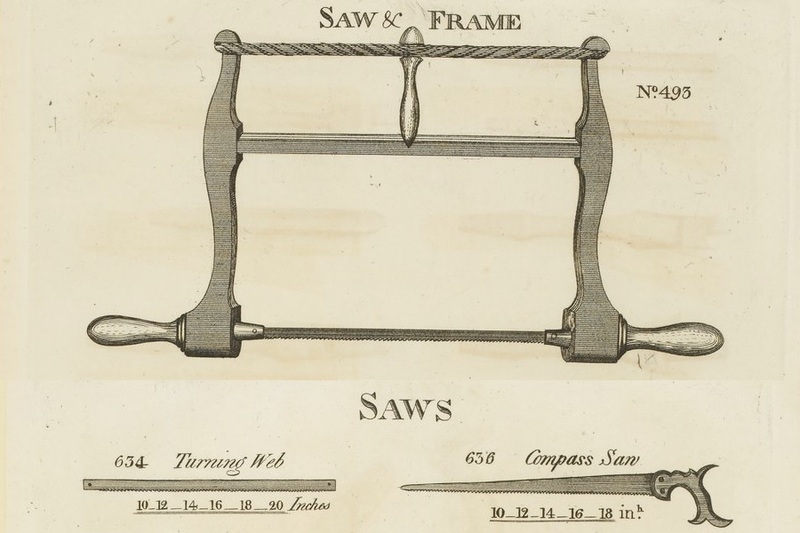 So at this point, I’ve covered the different types of long saws, joinery saws, and turning saws described in the early 19th century by Smith & Nicholson. Do you necessarily need one of each of these saws? Maybe, but probably not. How few of them can you get by with, and what’s the ideal nest of saws for today’s traditional woodworker? We’ll finish up this series with my recommendations next time. Posted in Hand Saws, Tools and tagged bow saw, compass saw, keyhole saw, pad saw, turning saw.